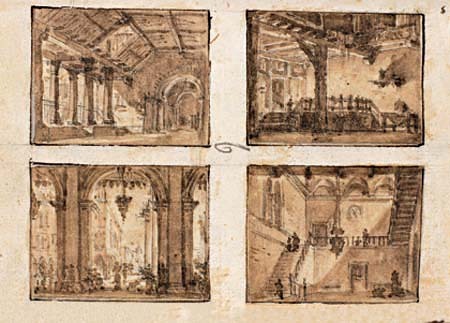 The exhibition starts with some drawings and designs by Francesco Fontanesi (1751-1795) and Pietro Gonzaga (1751-1831); two of the most important Neo-classical stage designers in Italy, these would in May 1792 produce the set-designs for the productions that marked the opening of the Fenice: Alessandro Pepoli’s I Giuochi d’Agrigento (with music by Giovanni Paisiello) and the ballet Amore e Psiche by Onorato and Giulio Viganò. Loaned by the Fondazione Giorgio Cini, these designs are a perfect illustration of the theatre design of the day. 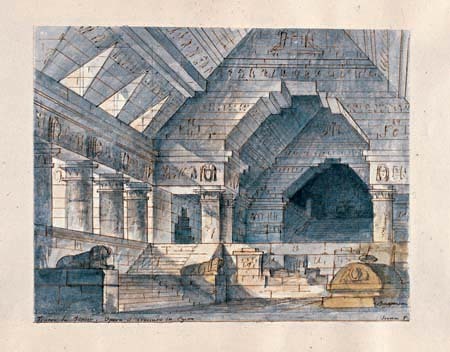 Then come various albums of drawings by the set-designer Francesco Bagnara (1784-1866), who would work at the Fenice from 1815 to 1839 – a particularly happy period in the theatre’s history, when it staged premieres of works by such composers as Rossini, Bellini, Donizetti and Meyerbeer. These invaluable collections chart the shift from away from Neo-classical taste in set-design to a more Romantic taste. The next part of the exhibition contains small albums of drawings by Tranquillo Orsi (1791-1844); a painter and designer, he gave ample proof of his own skill in pictorial composition when, for a few seasons, he stood in for his contemporary Bagnara. 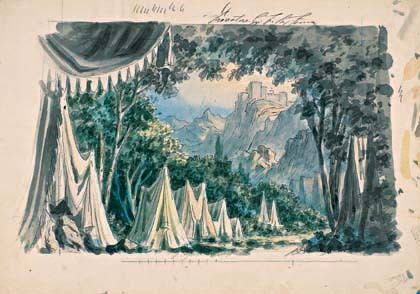 A large part of the show is dedicated to the work of Giuseppe Bertoja (1803-1873), an important stage designer of the Romantic period; head designer at the theatre from 1845 to 1873, he would prove to be a very sensitive and precise interpreter of the spirit behind the works that Giuseppe Verdi wrote for the Fenice in the period 1846-1857: Attila, Rigoletto, La Traviata and Simon Boccanegra. 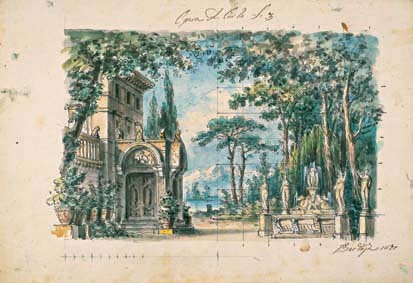 The final part of the exhibition is dedicated to Bertoja’s son and heir, Pietro (1828-1911), whose work as a theatre designer would reflect the changing tastes and techniques of the late nineteenth century. And it was Pietro Bertoja who collected his own and his father’s designs together in ten albums, nine of which Carlo Bertoja presented to the Museo Correr in 1966. 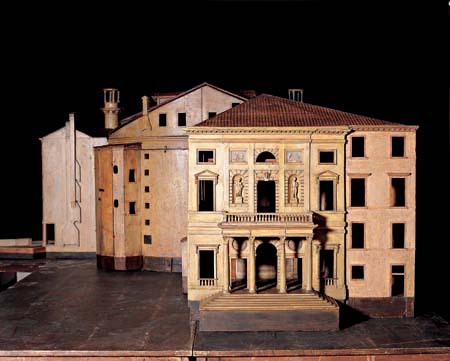 The show is completed by a wooden model of the theatre produced by Gianntonio Selva for the 1790 design competition (this is on loan from the Fondazione Teatro La Fenice), and further documentation regarding Giuseppe and Pietro Bertoja (valuable loans from the Museo Civico in Pordenone and from the Bertoja family themselves). The material is shown along with numerous libretti from the rich collection in the Casa Goldoni library.